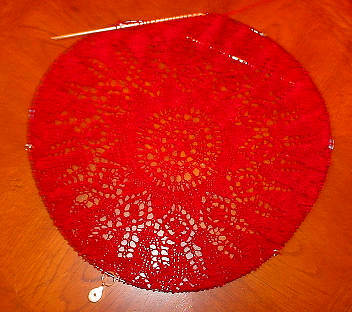 Miserable excuse for a camera and non-existent photo skills aside, you can see that I’m making good progress on the red doily. I have just completed row 52 of 72, and am beginning to think how I would like to end it off. The original instructions use a very simple crocheted bind-off, using one single crochet to gather together three knitting stitches, then chaining nine before gathering the next three knits with another single crochet. Two small complications – the instructions are from Europe and with 99% probability conform to UK term standards. That means that there’s a high possibility that the stitch referred to as a SC in the instructions, here in the US (and parts of Canada) is known as a slip stitch. More on this problem here. I’d have to play with both to see which look I like better. The second complication is a minor one – the photo of the original pattern clearly shows two rounds of the stuff, with the first worked to end off the knit stitches, and the second worked “belly to belly” of the chains formed in the first round. It would also not be a bad guess to surmise that the second round of slip stitch/chain loops uses chain segments that are one or two stitches longer than the previous row. Experimentation would be advised. So far no errors whatsoever, and the pattern has been very easy to follow.